The Percussion family family is an interesting case, because every member of the percussion section in band must play every instrument in the section. In elementary band, there are usually only two instruments played; the Bells and the Snare Drum. The percussion instruments are a part of the band, along with the brass and woodwinds families. Both bells and snare drum are members of the percussion family. Players of these instrument are unique in that they dont just play one instrument. Percussion players are responsible for learning an entire family of instruments. Beginning percussion students may learn the bells, snare drum, bass drum, cymbals, and several other small percussion instruments. Young percussionists frequently assume that they will just play the snare drum and move on to a drum set but all instruments have to be learned at some point. Since each of the percussion instruments are quite different, many band directors start students out on one instrument like the bells for the first few weeks of band and then teach the other instruments later in the year. The students who tend to succeed in the percussion section are those who are self disciplined. Unfortunately, band directors commonly spend a gread deal of rehearsal time teachin the woodwind and brass players. Boredom is a common problem among percussionists since they are not always engaged in the same instruction as the rest of the band. Taking care of percussion instruments is easier than most others. Since percussion instruments dont come in contact with the players mouth, cleaning is not as much of an issue. They all need occasional adjustments but day to day maintenance is not a big issue. A regular expense will be drum sticks and bell mallets since they tend to wear or get lost. Beginning percussion kits that can be purchased usually come with two instruments, a set of bells and a practice pad. Some students may want to purchase their own snare drum as well. A set of bells and a snare drum will get most students through an entire year of band and many school band programs do not even require students to own their own snare drum. By the way, the practice pad is a nearly silent version of a snare drum. It has the same feel and bounce but students can practice on a practice pad at home without frightening the pets or parents. The many instruments included in the percussion family include any instrument that is struck, shaken or scraped in order to produce the sound. Advanced percussion instruments include the timpani drums or kettle drums, the xylophone, marimba, vibraphone, chimes and many, many others. Most of the larger instruments are not used in young bands but all of these instruments are practiced by advanced players. Percussion instruments are heard in nearly every type of instrumental music group. They are a vital part of bands, symphony orchestras, jazz groups and rock groups. Many percussion instruments can even be great solo instruments. The good news is that each of the percussion instruments costs considerably less than most others in the band. There are several good choices for purchasing a beginning percussion kit. Kits that include the bell set along with a practice pad include the CB Percussion 8674 Junior Percussion Kit, the Yamaha SPK250 Jr. Percussion Kit and the Pearl PK-800C Percussion Kit. A good beginning snare drum from Giardinelli is the CB Percussion IS678BP Snare Drum Kit. 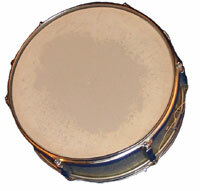 Purchasing used percussion kits can be a good option. There isnt a lot that can go wrong with a percussion kit compared to other instruments. If the pieces are all in place and the instrument doesnt look damaged, its probably a good instrument. Buying a used instrument is only recommended if you know an advanced percussionist player or band director who can test a used instrument before you buy.